This device 60V etricycle Power Battery Smart Charger can automatically identify 48V/60V battery voltage and shift the output polarities of the charger. It can adapt to the popular electric tricycles on the market. Embedded smart battery management chip. Users can know the battery status according to the capacity. Have the function of battery desulfation. Produce special battery desulfation pulse, automatically repair the batteries exceeding the storage term in the processes of circulation, storage and transportation and use, and recover chargeability of the batteries with sulfation failure. In each charging pulse, special battery repair pulse is added to restrain sulphation of lead-acid battery; harmonic components of this pulse resonate with the lead sulfate large crystalline molecule on the battery plate and destroy the condition for forming lead sulfate large crystalline, it also has the function of breaking the lead sulfate large crystalline. Adopt multi-stage constant current pulse charging mode. When starting charging, it charges the power battery quickly through a large duty cycle, and when the charging battery voltage is close to producing gas stage, smartly reduce the pulse charging current stepwise gradually. Each charging pulse is followed by a depolarizing pulse of 1~3 times the charging current, to ensure elimination of polarization voltage and cooling battery plates, so as to improve capability of charge acceptance. Adopt temperature compensation function. Calculate the gas-produced voltage point of VRLA battery based on the ambient temperature tested by temperature sensor; at the same time, analyze gas-produced voltage and make dual judgment through the raise of dv/dt not affected by temperature, which effectively solves the battery sulphation caused by low temperature undercharged as well as water loss and thermal runaway caused by high temperature overcharged. 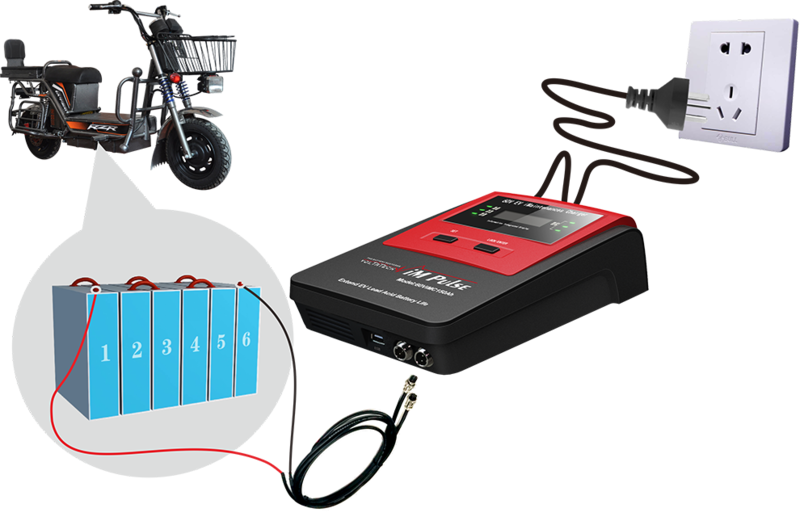 As you will read, this iM Charger 60L Battery Smart Charger for electric bicycle or tricycle is a multi-functional charging maintenance system developed by us based on our multi-year research results used for power battery of electric vehicles. It is applicable to digital pulse charging, non-destructive repair and pulse maintenance desulfation of all types of lead batteries in 48V/10Ah~150Ah or 60V/10Ah~150Ah. As integrated the above battery care function with smart pulse of adjustable wave width, it is also called as etricycle Battery Repairing Charger or etricycle Battery Life Extender as a kind of Battery Repair Tools. Looking for ideal Etricycle Power Battery Smart Charger Manufacturer & supplier ? We have a wide selection at great prices to help you get creative. All the Etricycle Battery Repairing Charger are quality guaranteed. We are China Origin Factory of Etricycle Battery Life Extender. If you have any question, please feel free to contact us.